This document is designed to describe the purpose and usage of the com.jFormTK Address Book. The com.jFormTK Address Book is a "Data Base"
The com.jFormTK Address Book is the "Glue" that is used by the Java Form Tool Kit [com.jFormTK] to connect information about individuals with the application forms. As a minimum, the com.jFormTK uses a small sub-set of the com.jFormTK Address Book to link people identified within the com.jFormTK application with the various application specific forms. The fields that are used in each com.jFormTK application are identified in this document with the "(^)" annotation. When should the com.jFormTK application end user use the com.jFormTK Address Book? 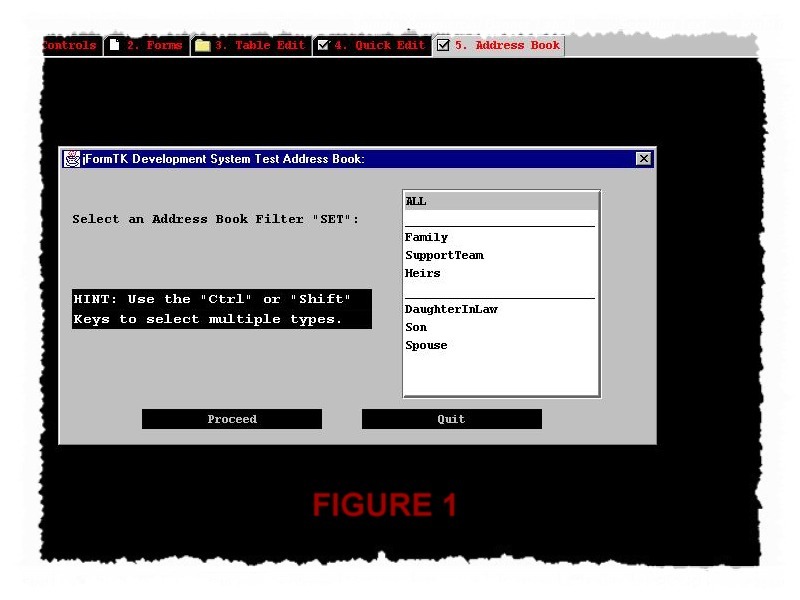 If the application end user already maintains an Address Book on their computer, then the end user should continue to use the existing Address Book. The com.jFormTK Address Book has the capability to identify a "Reference" where the registered user's Address Book is located. If the application registered user maintains a "physical Address Book, then the location of that "physical Address Book should be entered into the com.jFormTK Address Book Reference parameter. NOTE: For most com.jFormTK applications, it is imperative that the application end user maintain and keep current an Address Book of some kind. For example, for the Professional Computer Solutions Survivors List PLUS application, an Address Book will be essential to the registered user's survivors to locate Family members, the designated support team and the registered user's Heirs. The com.jFormTK Address Book is in essence a "Populace Data Base", i.e. a collection of names based on a specific criteria. For example, for the Professional Computer Solutions Survivors List PLUS Application, the com.jFormTK Address Book criteria is the Registered Users Family, Support Team and Heirs. Each com.jFormTK Address Book entry contains the usual address book parameter [(^) Name, address1, Address2, City, State, ZIP, Country, Phone, Fax, Cellular, Pager, Date Of Birth, Social Security Number, E-Mail Address, Personal Web Page Address]. A reference to the com.jFormTK Form [JFormForm] where "this" com.jFormTK Address Book entry was created. Used by the com.jFormTK Address Book [AddressBook] class to process the "Go To Form" button and by the com.jFormTK Add to Address Book automatic post processor feature [see Run-Time References document]. NOTE: There is an Anchor parameter for each "Type". See the "Type" description below. Contains a reference to another com.jFormTK Address Book entry to obtain the address parameters [address1, Address2, City, State, ZIP, Country]. For example, in the Professional Computer Solutions Survivors List PLUS application the "Child" Group Data Sets may have a SameAs reference to the childs Father or Mother com.jFormTK Address Book entry. This field is used to eliminate "Redundant" data entries. Consist of multiple fields for each com.jFormTK JFormField that has a "reference" to "this" com.jFormTK Address Book entry. For example, in the Professional Computer Solutions Survivors List PLUS Application there is an automatic com.jFormTK Address Book entry for the "Registered User". This entry is automatically given an entry "type" of "Spouse". If the "SameAs" field of a "Children" com.jFormTK Address Book entry references the "Spouse" com.jFormTK Address Book entry, then a "Reference" to the "Child" com.jFormTK Address Book entry is appended to "this" Reference field. This field is used by the Java Form Tool Kit [com.jFormTK] to manage the com.jFormTK Address Book element connectivity. Given the above "Type", an com.jFormTK Address Book query with types of "RegisteredUser", or "Spouse" would return the requested com.jFormTK Address Book parameters for this same person. where the fields separated by "+" are "Type" com.jFormTK Address Book field references. All  Displays all the com.jFormTK Address Book entries. Via a Formula. For example, in Figure 1 the available formulas are "Family", "Support Team" and "Heirs". See "Formulas" discussion above. Via a selected set of com.jFormTK Address Book types. See "Types" description above.